Playaround cartridges are double-enders, but they are not as long as Xonox' cartridges. There is game art for each game and arrows to tell which side is which. There are plugs that cover each end of the cartridge for when it is not in use, and these have the game title on them as well. 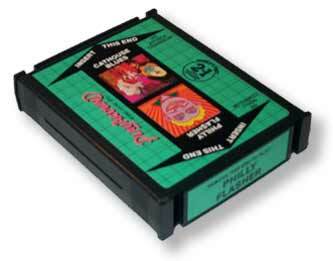 The cartridges were also packaged in small faux-leather cases inside the regular box that included a small lock and key to keep junior away from the adult games. Playaround packaging was quite nice, unfortunately (or maybe fortunately) their games were not.